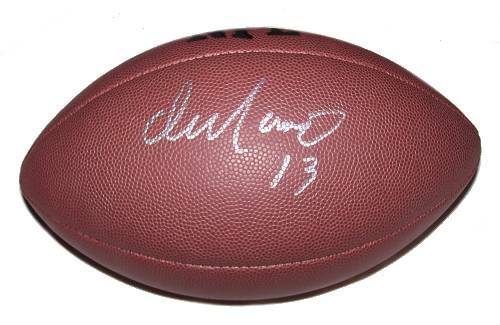 A Wilson NFL football signed by former Miami Dolphins quarterback Dan Marino. Comes with a Certificate of Authenticity. Dan Marino, Jr. is an American Hall of Fame former quarterback who played for the Miami Dolphins in the NFL. The last quarterback of the Quarterback Class of 1983 to be taken in the first round, Marino became one of the most prolific quarterbacks in league history, holding or having held almost every major NFL passing record. Despite never being on a Super Bowl-winning team, he is recognized as one of the greatest quarterbacks in American football history. Remembered particularly for having a quick release and a powerful arm, Marino led the Dolphins into the playoffs on numerous occasions ~ Wikipedia.